I just came across a junky broken non-backlit portable that I was able to get running, and I'd like to give a big props to techknight for all the information he's made available on the various forii over the years. There's some really good information out there, and it's almost all techknight. So thanks a bunch! Maybe now I can take a look at that diagnostic ROM card you were wanting. 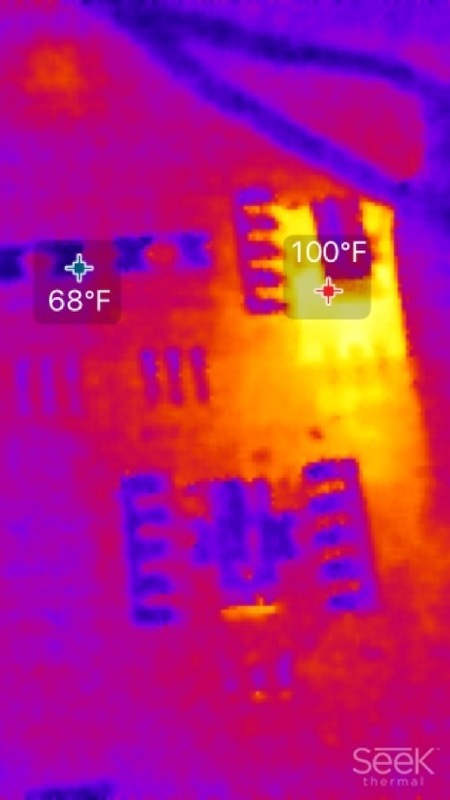 While I was messing around with it, I took some thermal pictures of the logic board while it was running. Kinda weird that's the hottest spot on the entire logic board. yup its all techknight, he is the portable go to guy!! How'd you do the (quantified?) 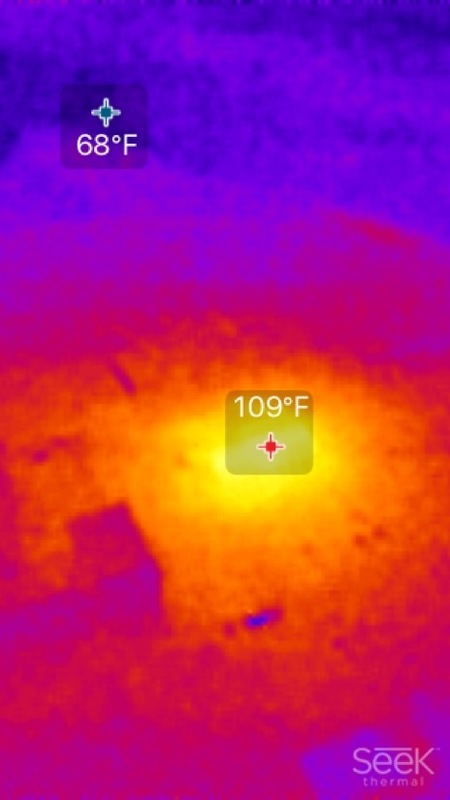 thermal imagery? The one thats getting hot is the main 5.2V regulator for the whole system. Everything. And its a linear regulator, not switching. So yea, its gonna get hot! The 74AC153 getting that hot really isnt normal. Hmm... However, the 74AC153 serves 2 purposes. 1 it controls the modem enable. 2nd half is the write data bit for the SWIM/FDDs. Yeah, I kinda take the absolute temperatures there with a grain of salt. The 74AC153 got a little warm to the touch, but definitely not what I'd consider hot. The 74AC153 serves 2 purposes. 1 it controls the modem enable. 2nd half is the write data bit for the SWIM/FDDs. Yeah, it probably shouldn't be getting warm for just those things. Maybe there's cap goo under it. I'll remove it at some point and clean underneath. I've been thinking about the ROM card a bit. The address space of the Portable is the cleanest of all the 68000 macs. It doesn't have the SCSI and other devices in the middle of the address space like the other machines. The ROM card slot pretty much only has the A1-23, D0-15, /DTACK and some other things that aren't particularly useful. In particular, no R/W signal. It has a /CS signal for accesses to $900000 - $9FFFFF. * A purely diagnostic ROM, which would essentially be something that would be relatively small, definitely fit within the 1MB of the $900000 space and could get by just using the stock /CS signal and not have to do any address decoding. But I was thinking about how a diagnostic ROM could be most useful. Writing to the screen would be good functionality, but a fair bit has to be working for the screen to be working right. Same for serial port access. What I was kind of thinking about is some LEDs on the card that are lit by default, and could be turned off by the ROM. For example, a fair bit needs to be working just for the ROM to be executing, so one of the first things the ROM does is turn off one of the LEDs to indicate the ROM has been entered. In order for LEDs like that to work, some additional logic is needed, particularly for it to be self contained on a ROM card. * A ROM expansion card has up to 5MB of address space, so it could get a ~4.75MB ROM EDisk. For that to work, additional address decoding logic is necessary, which would basically mean a CPLD. Doing one card that can be used for both purposes, just with different ROM images. The CPLD used for address decoding, could be used for the LED decoding too. If certain address ranges are read from, the CPLD could toggle an LED. I haven't done anything with CPLDs so far, so while thinking about this, I started checking out CPLDs. Basically 5V or even 5V tolerant CPLDs are essentially obsoleted, but are still available for legacy purposes. There's two main series' I've seen: Atmel has some that are 5V, but their development environment is $$. Xilinx's XC9500XL series is 3.3V powered but 5V tolerant, and this is what the floppyemu uses. The development for it is still available, and free, but was abandoned by xilinx 2 years ago. The QFP packaged parts are still available. They even make some PLCC44, although that part has been EOL'd and is only going to be available to the end of the year. So I was thinking the same as the floppyemu would be a good idea. 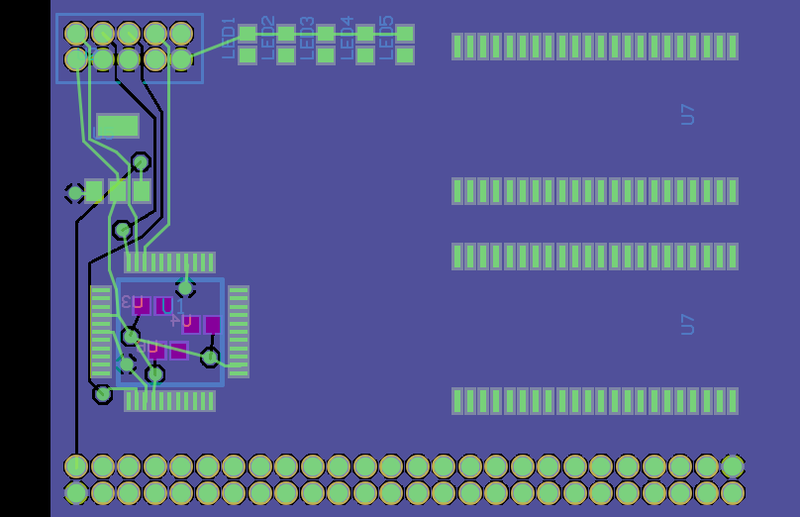 I've started attempting some layout, basically cribbing from floppyemu with the decoupling capacitors, 3.3V regulator, etc. I know I've already made some design mistakes, but hey, live and learn. Anyway, those are some of my thoughts on the subject. I've been looking at 29F800 in SOP44 packaging for the ROM. It would need an external programmer (or stringing the R/W line from another socket) to program it. Right now, I'm kind of thinking about doing 2 chips on either side of the board, for 4MB. Another would probably fit, maxing out the 5MB of ROM address space on the portable. Like the diag LEDs on iMacs. Nice. Three chips at right angles to what you've got there ought to simplify routing. I have a nice Backlit Portable M5126 with a new replaced lead-gel battery 6V 5Ah and SCSI adapter with CF card 1 GB instead the died HDD. It works fine with the battery and the AC/DC adapter. But powering the Portable with the battery only (without AC/DC adapter), the screen begins to flicker slightly. After open the battery control windows, clicking resume and than riactivating the Portable, it works fine also with battery power (without flicking). Has anyone an idea if it is a cap or inverter problem? I'm far from an expert on such things, but first step is always caps, if they haven't been replaced already. Caps and their leaked fluid are bad news, and when replacing the caps, be sure to clean up any goo, especially underneath nearby components. For things as old as the portable, the caps are guaranteed bad. Is the flickering the backlight or the display? yeah i said the same thing to him on ebay… haven't meant a portable yet that didn't need caps..
Rob… that ROM card that you are considering looks awesome!!!!!!!!!!!!!!!!!!!!!! So you could maybe load up to 5 megs of data into rom? that might be just enough to have a HD less portable!!! hey bbraun, what is your CAD environment? I can send you my RAM design, which has the correct dimensions and positioning for the PCB inside the portable. That'd be great. I'm using osmond pcb but I have no particular affinity to it other than it's free and works on osx. I know eagle works on osx too, and I can probably get by with the free license or go for the hobby license if that's still available.